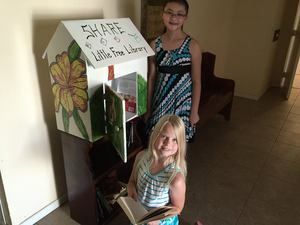 Little Free Library placed in foyer. Near the church office is a new addition that is catching the attention of church goers. It is the Little Free Library that has been constructed and placed by Robert and Joy Pearce. This colorful box is a place where anyone can take a book and leave a book to share, free of charge. There is no need for membership, computer scans or card check outs. And it is all entirely free! The Library nook was created by Robert and Joy. Their grandson, Pearce Lambert, helped to paint it with its bright and eye catching design.